I love graph paper. It’s quite possibly my number one favorite decorating tool–after my wine, of course. Before I spend even a minute moving furniture or pondering whether something will fit in a space, I bust out my trusty graph paper and get to work. The first space I graphed in our current house–and also the first space I decorated–was the living room and dining room. The space is one large open room with an archway in the center. With the exception of a short wall in the dining room, there are windows on every single wall in this space, which makes furniture placement a bit of a challenge. On top of that G has a monster of a TV that he wanted to stay in the living room. I wanted a lot of seating, but I also like things to feel spacious and open. And last but not least, I wanted both spaces to complement each other, but still be two distinct spaces. How did I make this all happen? Well, it all started with graph paper! First I measured literally every inch of this space to determine exactly how much space I had to work with and exactly where things like windows, outlets, cable jacks, and floor registers were placed–all things that need to be considered when deciding where furniture and electronics should go. For this step I do a rough sketch on notebook paper. I’m just looking for the measurements at this point. 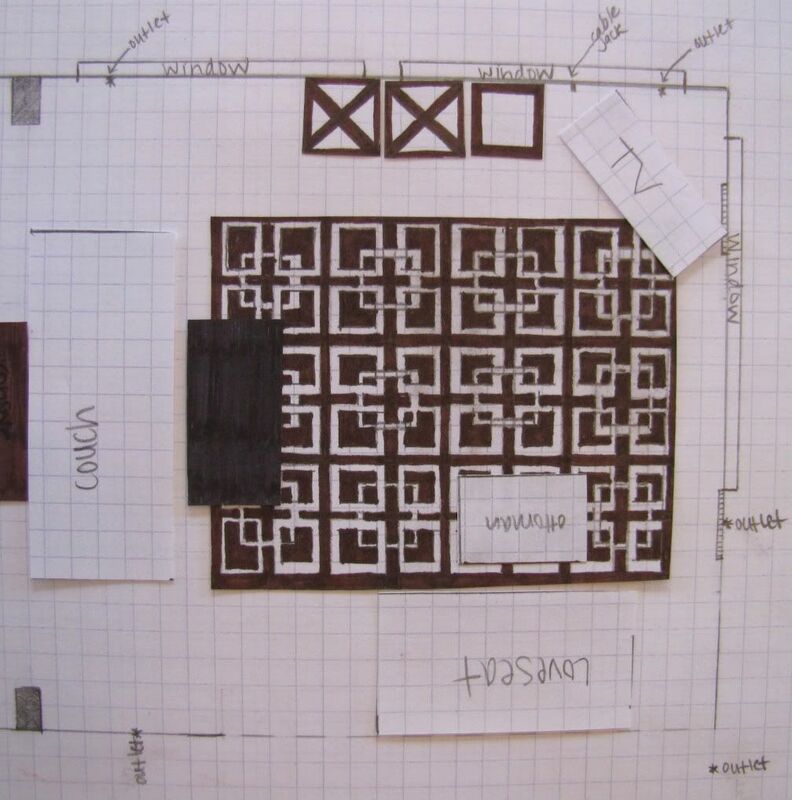 Next, I graph out an exact replica of the space on graph paper, only in a much smaller scale. Now this may seem like a difficult task, but it’s actually very simple. I measure the room in inches, divide by 10, and then graph everything in centimeters. For example, let’s say a wall is 123″ wide. 123 divided by 10 = 12.3. 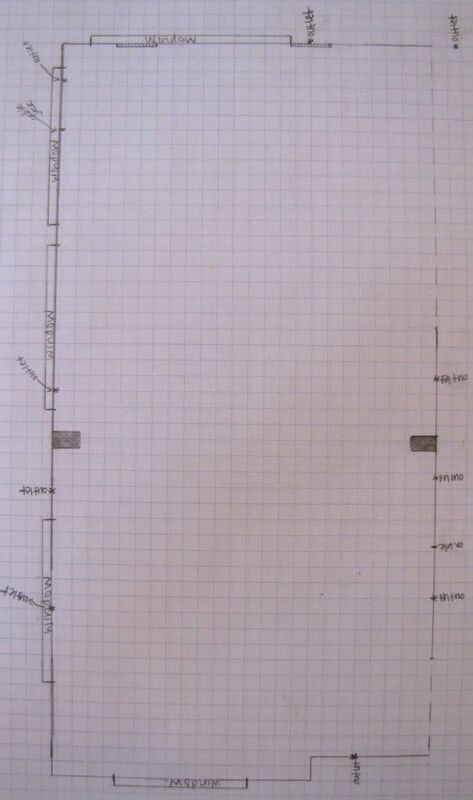 So for that wall I measure out 12.3 centimeters on my graph paper. And since centimeters are in tenths, it’s actually very easy to measure 12.3 centimeters–it’s just 12 centimeters plus 3 more little hash marks on the centimeter side of your ruler. Piece of cake, right? Let’s take a closer look (click to enlarge if needed). The two small shaded squares toward the center of the side walls is the archway–that’s how much surface area the actual archway takes up. Each outlet is marked with a star, cable jacks are marked with a hash mark, floor registers (which stick out from the wall a little bit) are drawn as little rectangles on the inside of the floor plan and marked with stripes, and windows (which don’t stick out from the wall) are drawn as rectangles on the outside of the floor plan. 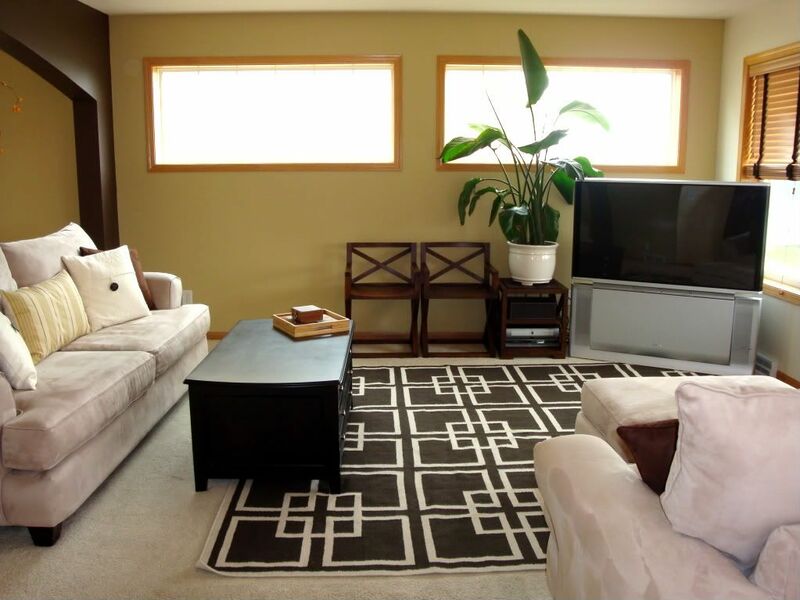 The dotted line on the right side of the living room represents the separation between the living room and the kitchen. That space is all open, but the flooring changes from carpet to hardwood so I wouldn’t want my living room furniture going past that dotted line. There’s another dotted line on the bottom right in the dining room, which is an open space that leads to the entryway. Once the space is all graphed, it’s time to turn to the furniture. Again, I measure everything in inches, divide by 10, and then graph it in centimeters. 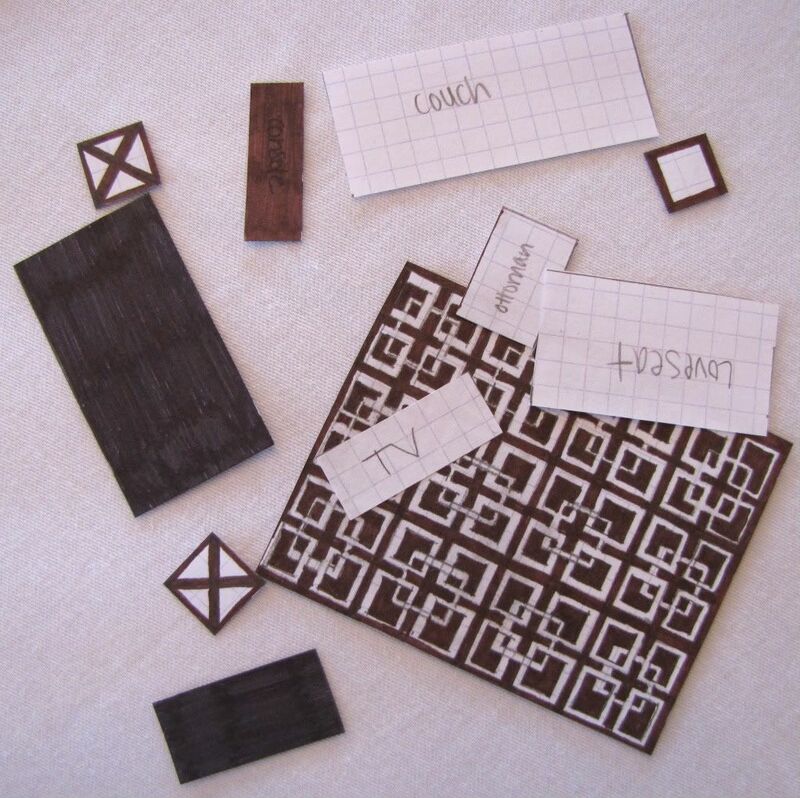 Then I label each piece of furniture and cut them all out so I can move them around my little paper house. 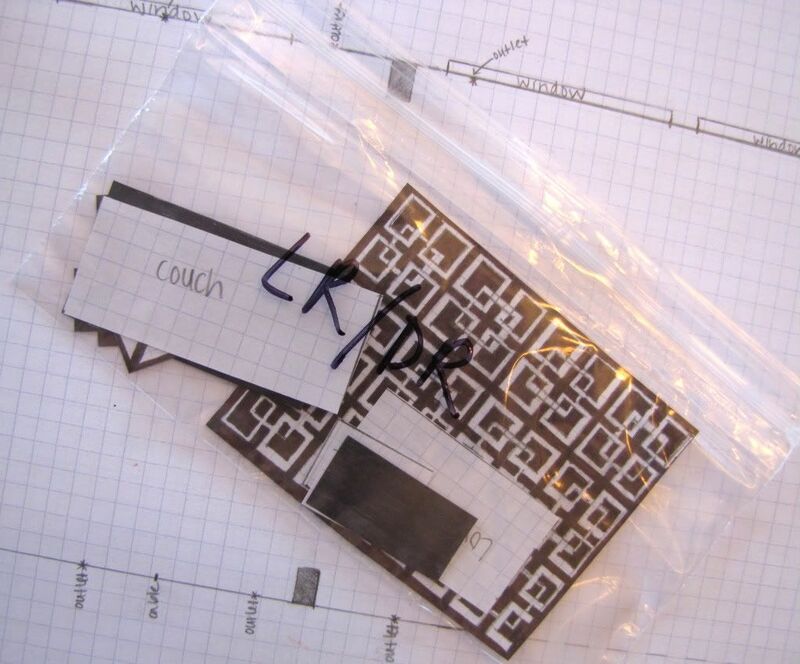 It’s much easier to move a paper rectangle labled “couch” than it is to move an actual couch! My paper living room furniture started out all white until I decided I needed a rug, but was having such a tough time visualizing it in the space. Not to mention the fact that I couldn’t decide on a size. And would it be too much brown? If I had Photoshop, or even any basic computer editing skills, I could have doctored up a picture to get a sense of what things would look like, but alas I have no Photoshop and am rather technologically challenged. So to put my mind at ease I got out my markers and started coloring my little paper furniture. Yes, I got a little OCD when it came to coloring the rug. I admit it. I own that. But you know what? My worries about purchasing the rug disappeared after seeing it in my paper living room, so I ordered that bad boy and now I can’t imagine the room without it! When I’m all done playing house, arranging furniture, and deciding on rug sizes, I toss all my paper furniture in a small ziploc bag for safekeeping until next time. Everything stays in my little graph book where I can always come back and reference it when needed. It’s time consuming up front, but so convenient to have later when I’m looking at getting new furniture or I’m interested in re-arranging a room! WOW! You made that look so easy! 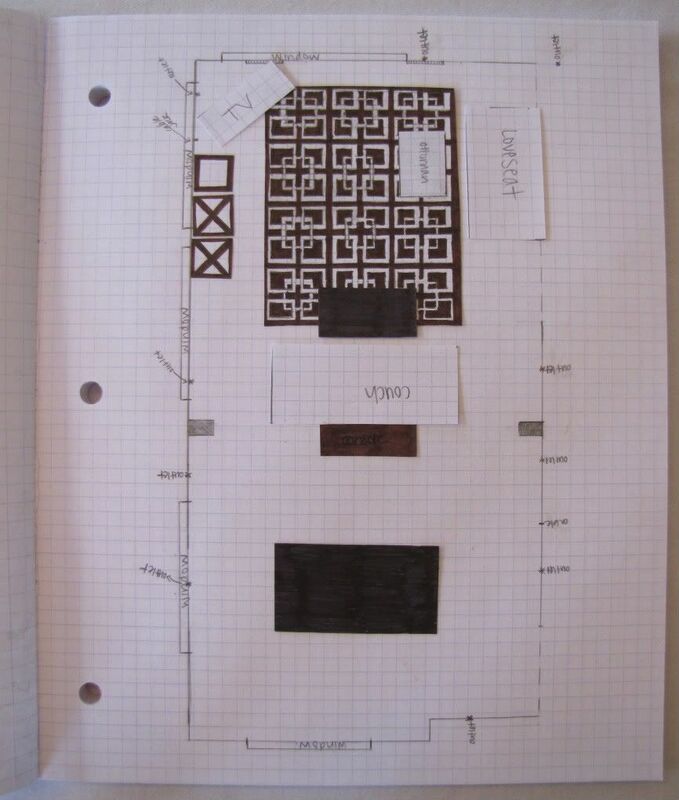 I absolutely love that you colored the graph paper to look just like your carpet. I would so totally do that, too! I’ve been reading your blog for months now, and I figured I should finally say hello. Thanks for making me laugh and inspiring me on a regular basis. Congratulations on your pregnancy! I can’t wait to read posts about your baby adventures. Happy Monday! Why didn’t you go into interior design, D? You would be so great at it! haha I LOVE that you went OCD on the rug. Fabulous ideas, once again! Thanks for sharing! You do make it look easy – I love your room. What a great idea! Love your space. LOVE that you colored the rug exactly. I admit that I do this too, except on excel. I actually did an entire floorplan of our house because I’m totally OCD. I’m not gonna lie, the whole metric conversion math thing scares me. And not just because my brain has no room for equations, but because I know that about halfway through I’d start “measuring from the heart” (aka guessing). Brilliant, though. I love graph paper too! That room looks so great! Great idea with the furniture cut-outs! I work in an elementary school and as part of my job I’m often helping teachers arrange their classrooms so that they work for them and their students. This year, we used post-it notes to denote furniture so they could move their “furniture” around on the page before physically moving it. But, I like your idea of actually creating the furniture in the shape that it is. I’ll have to share this with my colleagues! Also, if you go to AShome.com they have this great ‘Room Planner’ feature. Totally love it. Great idea! We still don’t have all our furniture moved to our new house, so I will have to try this. DH lives for graph paper, but that’s the engineer in him. I think when we finally do move into our own home and start decorating, he’s going to have more fun than me playing around with different layouts. Uh. Mah. Gawd. Impressive! The best bit for me was saving the adorable cutouts in the baggie for next time. You are sure to pass on the cleverness-gene to your little one. Great idea!!! Looks so easy, but I could probably never do that! Wow ~ you are WAY more organized than I am! Great idea though. I love graph paper, too. Although I am no where near as organized as you are about it. I love your little paper house!! Oh my gosh! I started reading your blog a few weeks ago and loved it then, but i am now in.love. You had me at graph paper. I couldn’t live my life without it. I redecorate my house about once a year, each time thinking that this time will be the last! I’m about to bust out the graph paper and start my third attempt! I love this post. Very type A, like a grown up version of paperdolls. Wow! You rock my little bitty world. Will you come to my house and help get my shat in order? I really need to do this with our furniture as we may be moving from our house to an apartment in the city and we want our main pieces of furniture to fit rather that put it in storage. I would like to know where you bought your couch and matching chair from, we are in desperate need to replace our and I love the neutral color, and it seems like it will be easy to clean of pet hair. Thanks everyone! And for those of you thinking this is too complicated to try yourselves–you really should give it a shot! I promise it’s much easier than it looks. And well worth the time and effort. @Denise–Hi, thanks for your first comment! You’re so sweet. @Beth–that is such a great compliment, especially coming from you! Thank you! @NIKKISS08–Love the excel idea. Very neat. @Nicole–hope it helps with your classrooms! @LizzieBeth–I’m not very technologically advaced, but I’ll check that website out. Thanks for the suggestion. @Sarah–welcome back from vacation, and thanks for the well wishes! @Ashley–happy to hear I found the way to your heart, lol! @CarolinaBelle–“…like a grown up version of paperdolls.” Love that! @Sima–our living room couch and loveseat are from Slumberland (www.slumberland.com) although I recently looked on their site to try to find them for someone else and it looks like they’re discontinued. The fabric is microfiber, though, if that helps. Good luck! Thanks for your reply. Just my luck the sofa is discontinued. I am sure I can find something similar with a bit of research. Every one loves a little OCD I wish I would have done that long ago. It would have made couch/sofa moving much easier our first Christmas – darn tree is too big but I don’t want to get a new one. I’ll also email you this info in case you don’t see this reply. i’ve been reading your blog for a while and i love all of it, your clothes, your decorating, your bags, your wine (even if it is on hold). 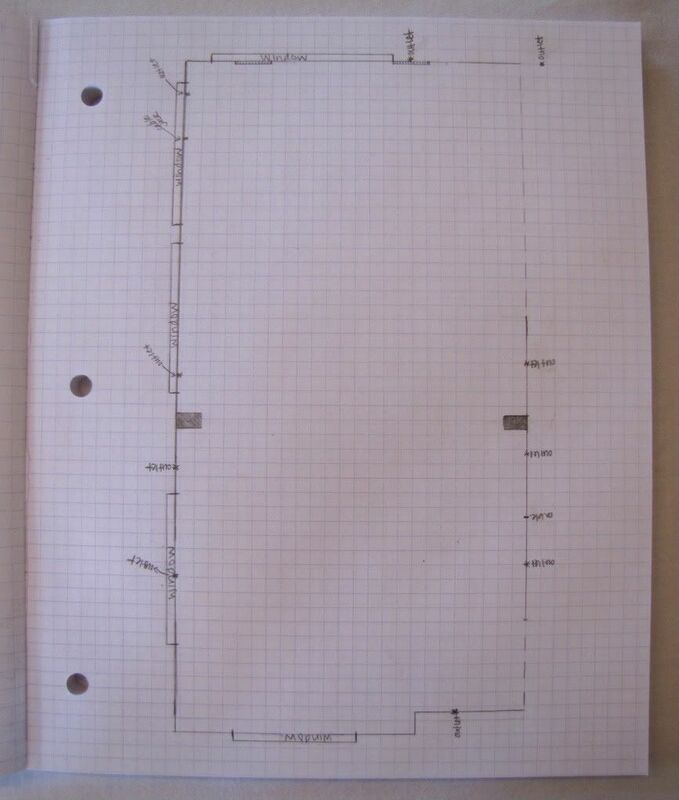 i love that you do a graph paper room. i have been doing this (graph paper and measurements and all) since i was a kid. everytime i wanted to rearrange my bedroom my mom and i would do this before moving any furniture. it just makes so much sense and saves so much time and energy. i’m glad someone else is as ocd as me. Love this – I use graph paper like it’s my job. I also have taken to Floorplanner.com for quick checks to see if something will work – it’s easier to sneak at work than cutting out graph paper :). But it’s not great for intricate things – like measuring in inches. How OCD are you? I do the same thing but I do it on the computer.. and people think I am crazy.. but how could you do it any other way?